Features a flexible mounting system that can be utilized with most major projector models. Whether in use in a home theater, a conference room, or in a classroom, the possibilities with this mount will protect your investment and adjust to your needs. 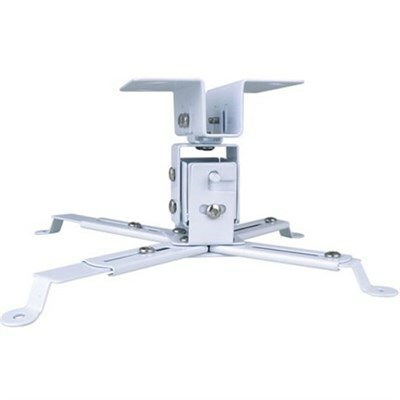 It's mounting interface features 4 double-jointed retractable support arms that allow independent, flexible, and precise positioning to properly secure your projector at any desired mounting point. Engage and secure your projector with 360 degree angle rotation with independent tilt ( +/- 15 degrees ) and swivel (+/- 8 degrees) customizability and height extendability ( 16.9” up to 25.6”) whether installing as a vertical hanging, side hanging, or ceiling mounted. Constructed to avoid blocking major projector vents and access points needed for lamp and air filter replacements. This will minimize the risk of overheating while maximizing the projector's lamp life and performance. It's design also features a built-in cable and wiring concealment system to provide a professional and uncluttered presentation.